We presented 4 cases with “destruction hydrocephalus” and pathophysiological and clinical features were studied. Intracerebral hemorrhage with ventricular perforation, meningitis with cerebritis and severe cerebral contusion are thought to be causative pathological states of destruction hydrocephalus. In this hydrocephalus, dilatation of the ventricle occurs irregularly and extensively in relatively short periods. This phenomenon is remarkable when the ependymal layer of the ventricle is destroyed. 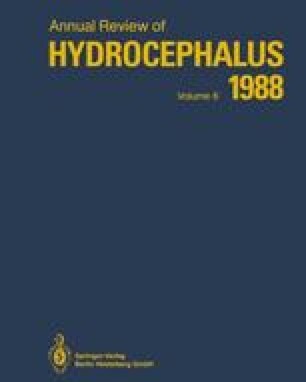 Ventriculostomy with the shunting system, which consists of a low pressure value, is required in the early stage of hydrocephalus. Although the prognosis is generally fair due to coexsisting primary brain disorders, it is essential to promote the recovery of the primary disorder, and to minimize the secondary brain damage by the ventricular shunt.